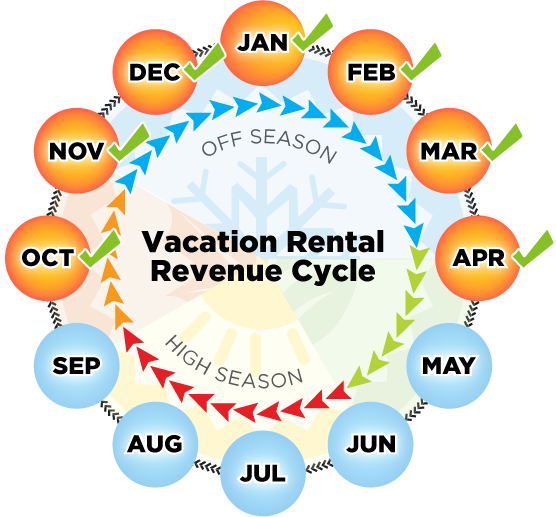 The #1 Snowbird Rentals Resource since 2002! Fast, Easy, Effective. We provide a top-notch central hub of listings tailored to the 'snowbird lifestyle' with specific pricing, tools and info tailored to the offseason monthly & MULTI-month guest, so snowbird travelers can find the best prices & complete information on condos, vacation homes, hotels & resorts areas they would like to visit or even make their second home! You'll get visibility on 18 highly active websites, but with only one login! It's the 'Write Once Display Many' principle. That's right, each time you log in & submit new information on our portal, all 18 sites with tremendous numbers of visitors, will update immediately with your new info, so visitors are able to access your up-to-date rental property photos, availability, rates & info... all this visibility & functionality for ONE low annual price with The Snowbird Company's time-proven 'American Snowbird Network' interface! I rented my unit from one of your many leads. I could have rented it at least ten more times had I had more units! Thank you. I have to tell you, your site is wonderful. It took us no more than 3 days to secure a contract. We had (otherwise) rented to a Canadian couple for the past three years and when they canceled at the last minute, it left us scrambling! Thank you for such an affordable, baluable resource. We've recommended your site to many others. I have used The Snowbird Company to advertise my rental since 2013! Through this website I am able to secure a Snowbird from January - March every year, and then utilize my property for myself and our family the remainder of the year. I'll continue using this service every year. We've secured a two month booking using The Snowbird Company! What a wonderful service for me as an owner! I've received 10 call leads this month, but my property is already booked. We've done really well using The Snowbird Company. We're almost booked up for the winter months [in August]. We're sending leads to our other friends who own rentals! Thank you... The site was great to use. We received a lot of inquiries... No complaints! We have gotten a TON of leads from The Snowbird Company. Our listing is in a 55+ community that Snowbirds really enjoy. I love this site! It is really easy to use!